When girls are toddlers, they think makeup is a toy or something to eat. 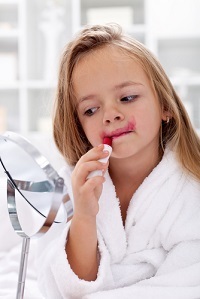 As preschoolers, they might create a “kiss” impression with their lips while trying to apply makeup like mommy. When they hit puberty, they become more aware and self-conscious of their bodies and what others might think of them, and may start showing a genuine interest in wearing makeup. When and where to allow your daughter to wear makeup is a personal choice based on your own beliefs and your individual child. Children almost always grow up faster than parents are prepared for, so it’s important to decide in advance at what age and in what amount makeup will be allowed. Setting clear and consistent boundaries, and explaining why you’ve set those limits, will help children accept and obey the rules. Teaching your daughter to use makeup can be a time of bonding, too, as well as a lesson in the proper use and appropriate amounts of makeup. Emphasize that makeup is meant to enhance, not hide. Beginning with a subtle look using light, neutral colors may satisfy both mother and daughter. Carol Tuttle, author of Dressing Your Truth: Discover Your Personal Beauty Profile, suggests beginning lip gloss between ages 10-12, foundation and cover-up at 13-14, and progressing to blush, eyeshadow, eyeliner and mascara between 15-17. Look for products that are hypoallergenic and oil free to cut down on acne. Mothers may wish to take their daughter to a professional makeup artist who can demonstrate that a little goes a long way. Testing stations in the mall are a great way to experiment with a variety of colors and styles without committing to anything. To encourage an acceptable look, mothers may point out pictures of models or teen idols who utilize the style they find appropriate. Children learn the most from what they see their parents do. If parents judge others on their personalities and not their looks, children will learn that it’s what’s inside that counts. How parents view and speak about themselves is also vital. If a child constantly hears a parent say, “I’m fat, ugly, or getting old,” they may begin to base their self-worth on their appearance. It’s important to pick your battles and keep the big picture in mind. If your daughter’s allowed to wear some makeup by middle school, the novelty will likely wear off on its own. After all, if a girl wants to try makeup, she eventually will, and trying to keep her from it altogether will likely incite rebellion. It may be better for parents to allow her to wear some makeup while they can monitor it. Parents can also benefit from support from friends and family as their little girl begins exploring who she is and making the transition into young womanhood. This can be a very positive time if both parents and daughters seek to listen and communicate with each other in a loving way.